A little old lady from Wisconsin had worked in and around her family dairy farms since she was old enough to walk, with hours of hard work and little compensation. When canned Carnation Milk became available in grocery stores in the 1940s, she read an advertisement offering $5,000 for the best slogan. She thought to herself, I know everything there is to know about milk and dairy farms. I can do this! She sent in her entry, and several weeks later, a black car pulled up in front of her house. 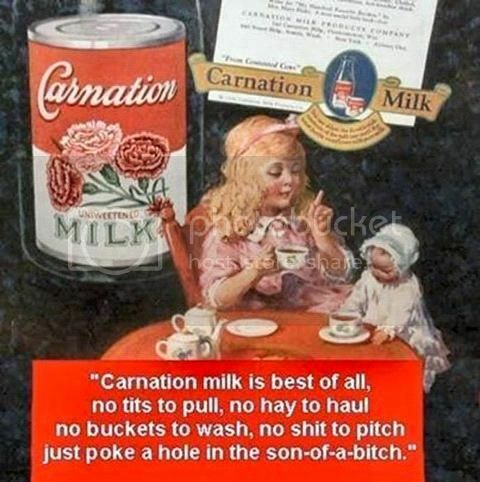 A large man got out, knocked on her door and said, "Ma'am, The president of Carnation milk absolutely LOVED Your entry.....So much, in fact, that we are here to award you $1,000 even though we will not be able to use it for our advertisements!" He did, however, have one printed up to hang on his office Wall. She should've won first prize, shouldn't she! So is it a true story then?